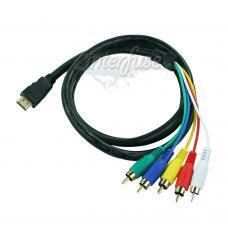 A new 5 RCA RGB Audio to HDMI Video Cable that supports up to 1080P resolution. This is a unidirectional cable that works only to adapt from 5 RCA out to HDMI in. The cable itself will not convert digital signals to analog signals.